DHD have produced the new Leighton Taylor Consulting website. 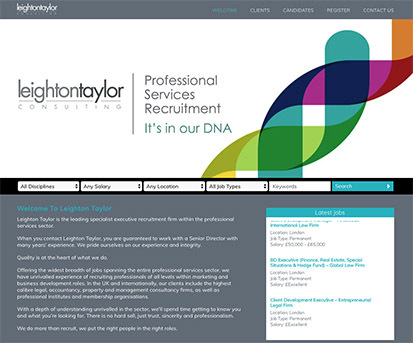 Leighton Taylor is the leading specialist executive recruitment firm within the professional services sector. When you contact Leighton Taylor, you are guaranteed to work with a Senior Director with many years’ experience. The consultancy prides itself on their experience and integrity. Quality is at the heart of what they do. Offering the widest breadth of jobs spanning the entire professional services sector, they have unrivalled experience of recruiting professionals of all levels within marketing and business development roles. In the UK and internationally, their clients include the highest calibre legal, accountancy, property and management consultancy firms, as well as professional institutes and membership organisations. With a depth of understanding unrivalled in the sector, they’ll spend time getting to know you and what you’re looking for. There is no hard sell, just trust, sincerity and professionalism. Giles Taylor founded Leighton Taylor in 2009 and specialises in senior level appointments. With unrivalled experience working across the whole professional services sector, he was one of the first consultants to recognise the huge potential for marketing and business development within partnership environments. To date Giles has spent over 20 years recruiting exclusively in this area, building a strong track record of filling vacancies at a Senior Manager, Head of and Director Level. In the mid-nineties he set up the professional services division at Resources Group and managed it for 13 years. With a realistic and honest approach, he has consistently been able to produce very positive results for his clients and candidates recruiting nationally and internationally through both contingency and search & selection assignments. With our experience we advise and partner firms, helping them plan and develop their marketing and business development teams to support and elevate the business to the next level. We completely understand not only your recruitment needs, but the needs of your business also. We can provide detailed sector specific information, gathered over the past two decades to advise our clients on anything from salary scales; including base salaries and bonus structures, through to advice on job specifications, current trends in the market and the availability of a desired skillset for your team. Operating on a NO placement, NO fee basis, a call to Leighton Taylor can mean access to a number of CVs that you have not already seen. What sets us apart is that we span the entire Professional Services sector, so have a vast network of candidates and only retain quality CVs. So whether this is the starting point of your campaign or you may have been trying to recruit for some time and require fresh impetus, we will have suitable people. All of our high-calibre candidates have been thoroughly interviewed and screened and only after their express permission has been established will their CV be forwarded to a client. As well as a high profile position on the Leighton Taylor website, roles are advertised anonymously and at very short notice on all the leading industry job boards. This service is absolutely free and means that you will not spend your advertising budget on these sites. You will then only receive CVs of those candidates that are appropriate for your roles, meaning you won’t have to sift through unsuitable candidates and can focus your time better elsewhere. If it is felt necessary to advertise a specific vacancy in a sector publication an advertisement will be designed, drafted and agreed to a client’s approval. Leighton Taylor has over 20 years’ experience in writing copy specifically for professional services vacancies and has a strong track record in attracting outstanding individuals through this process. Once a recruitment advertisement has been published you will be kept fully updated on the response and after a detailed interviewing process, a shortlist of applicants will be produced to an agreed timescale. Leighton Taylor will manage the process through to a successful appointment. With a great track record in placing senior candidates, with our Senior Hires team, this is particularly effective for Head of/Director level positions or roles where a distinct skill set is required. Having established a brief with a client we can identify a number of leading individuals both within and outside of the sector through a detailed research program. Potential candidates will then be contacted and assessed for their suitability. Once completed, Leighton Taylor will send a shortlist of CVs to the client and then manage the interview process through to offers and placements. Leighton Taylor has a strong track record in recruiting for regional professional services firms. So if you are looking for your first marketing/business development specialist or want to expand an existing team, we will find you individuals that suit your partnership’s culture. Interim and maternity cover roles can sometimes be problematic for companies. With a position to fill, an interim is often required at very short notice. A number of candidates at all levels register with us looking for exactly this type of role – either for short or long-term assignments. They will generally have strong qualifications and previous professional services experience enabling them to come into your firm and hit the ground running from day one.